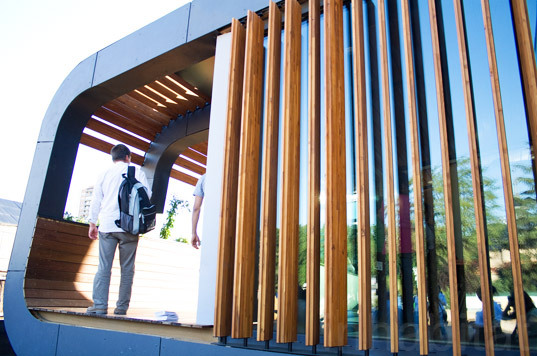 The Urcomante Team didn’t have to travel very far for the European Solar Decathlon this week in Madrid, Spain — but their home’s design has taken sustainability a long way. The home’s handsome postmodern facade is a prelude to how forward thinking this project is. 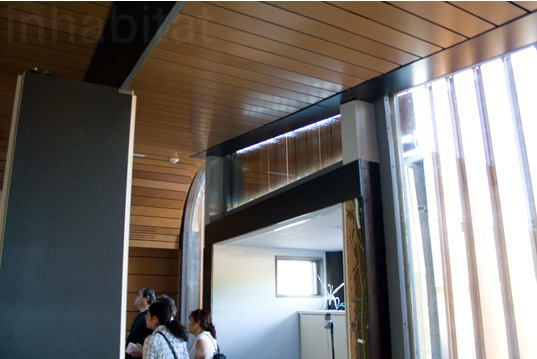 A strong contender in this year’s Solar Decathlon, the Urcomante house features walls and a roof covered in photovoltaic panels, while the inside is amply sunlit and adaptable, with interchangeable rooms. The team is a group of dedicated students and teachers from the University of Valladolid, Spain. The Urcomante’s rooftop solar array produces an impressive 10 kWhrs of energy and also features evacuated tube hot water heaters. The side louvers can adjust to let the winter light in and block the harsh summer glare. The Inside is broken into six “modules” that can be reorganized to fit the occupants’ needs. The inhabitants will probably spend a lot of time on the veranda. The home’s construction materials were sensitively sourced — sustainable, locally harvested woods make up the structure and it is filled with insulation made of wool. The inclined roof also captures water, and along with gray water reclamation there may be no need for an incoming tap. The team hopes to see this house as a working production model. 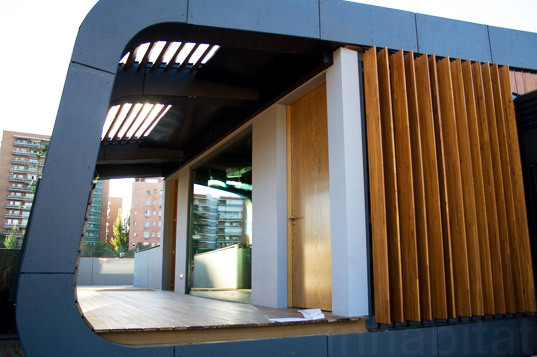 The Urcomante Team didn’t have to travel very far for the European Solar Decathlon this week in Madrid, Spain -- but their home’s design has taken sustainability a long way. The home's handsome postmodern facade is a prelude to how forward thinking this project is. A strong contender in this year's Solar Decathlon, the Urcomante house features walls and a roof covered in photovoltaic panels, while the inside is amply sunlit and adaptable, with interchangeable rooms. The team is a group of dedicated students and teachers from the University of Valladolid, Spain.